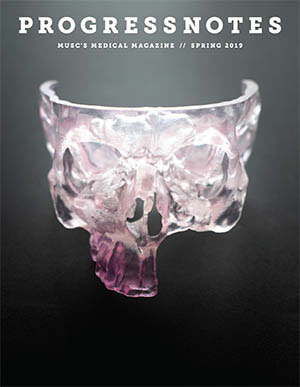 After extensive development, the Medical University of South Carolina (MUSC) Skull Base Center recently launched the nation's first Skull Base Telehealth Video Consultation Service. It is aimed at lowering the socio-economic and geographic barriers to specialized healthcare that many patients face. 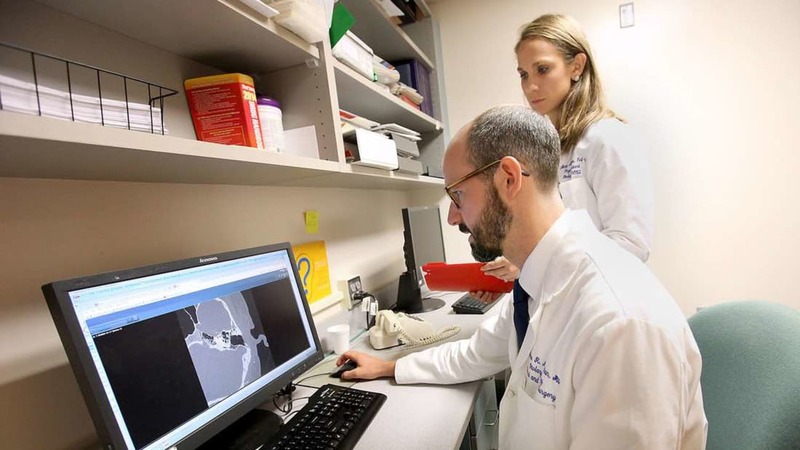 "We want to help patients who already have a diagnosis and a known pathology to get the best care they can as efficiently as possible," explains Teddy McRackan, MD, MSCR, Assistant Professor of Otolaryngology-Head and Neck Surgery and Director of the MUSC Skull Base Center. Skull base disorders require highly specialized treatment because the base of the brain is an extremely difficult area to access. MUSC's Skull Base Center is one of a very few centers in the country focused exclusively on treating problems of the cranium floor and has one of the largest teams of skull base experts in the southeastern US. "We're one of the only centers that performs hearing preservation surgery in South Carolina and we're the only place in South Carolina that can do auditory brainstem implants," says McRackan. The Center is also ranked number one in the country for treating cerebral spinal fluid leaks by the University HealthSystem Consortium. "MUSC is a leader in the telehealth space and already had the infrastructure in place," says Zachary Soler, MD, MSc, Associate Professor of Otolaryngology-Head and Neck Surgery, and Director of the Skull Base Telehealth Video Consultation Service. "Our task was to figure out how to leverage the video visit functionality that was available in our EPIC electronic medical record system to build this application." While telehealth technology is not new and is currently used by many health systems, it is most often based on a 'telehealth center' model. This requires patients to travel to designated telehealth clinics where they can receive long-distance care or consultations with specialists who are located at larger health centers far away. The MUSC telehealth video consultation model is ground-breaking because it is designed as a direct-to-consumer application. As soon as a patient's EPIC account is created in the MUSC system, they can download an app from their MyChart web page that enables them to have video visits on their smart phones, computers, or tablets from where ever they are. Patients who do not have access to a digital device with a camera can also have telehealth consults but without the video link. "If there's no smart phone or computer, we can do the consult on a regular phone call. But it's really ideal if there's some sort of camera – most people like the face-to-face visit so they can see who we are. It feels more like we're really meeting and getting to know each other," says Soler. The Telehealth Video Consultation Service is a revolutionary way to put top-tier care within reach of patients who live far from the MUSC main hospital in Charleston, SC. When patients are diagnosed with a skull base disorder, their physicians can contact Carly Clarke, RN, the Center's Patient Care Coordinator (skullbase@musc.edu), to arrange a telehealth consultation. She collects medical records and test results for the team to review and then schedules the call with the patient. During the consult patients, family members, and physicians get acquainted, discuss treatment options, and ask and answer questions. Any additional tests that might be needed can usually be done locally as well. "This really streamlines their care and cuts down the number of trips they have to make to the Center. Patients have the consult in the comfort of their own homes and get their tests done where they live. A lot of them can just come once for their pre-op appointment and have their surgery the next day," explains McRackan. Because diagnosing and assessing skull base disorders relies on a combination of imaging studies, hearing tests, and the patient history, these cases are a good fit for the video consultation platform. "This is the future of tertiary healthcare. This 'spoke-and-wheel' model with a centralized healthcare center is coming and we wanted to embrace it rather than shy away. In the future, we think a large number of our referrals will come through telehealth channels. It's a perfect set up for us," says McRackan. For Soler, it's about leveling the playing field so that every patient can access world-class care when they need it. "We're leveraging technology to make the highest quality care available to everyone, regardless of where they live or their financial means. A lot of our patients have transportation challenges or simply feel overwhelmed by the thought of travelling to an unfamiliar place. Now, with just a smart phone, tablet, computer, or telephone, we can provide all patients with the same state-of-the-art care, regardless of socio-economic or geographic barriers."